A view of Saturn's moon Dione captured by NASA's Cassini spacecraft during a close flyby on June 16, 2015. The diagonal line near upper left is the rings of Saturn, in the distance. Cassini’s closest approach, within 295 miles (474 kilometers) of Dione's surface, will occur at 11:33 a.m. PDT (2:33 p.m. EDT). Mission controllers expect fresh images to begin arriving on Earth within a couple of days following the encounter. 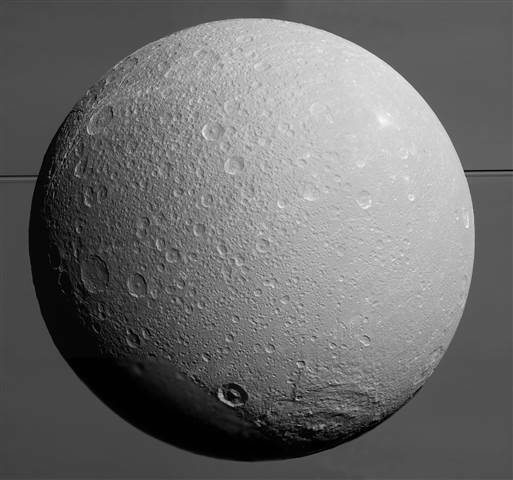 Cassini scientists have a bevy of investigations planned for Dione. Gravity-science data from the flyby will improve scientists' knowledge of the moon's internal structure and allow comparisons to Saturn's other moons. Cassini has performed this sort of gravity science investigation with only a handful of Saturn's 62 known moons. During the flyby, Cassini's cameras and spectrometers will get a high-resolution peek at Dione's north pole at a resolution of only a few feet (or meters). In addition, Cassini's Composite Infrared Spectrometer instrument will map areas on the icy moon that have unusual thermal anomalies -- those regions are especially good at trapping heat. Meanwhile, the mission's Cosmic Dust Analyzer continues its search for dust particles emitted from Dione. This flyby will be the fifth targeted encounter with Dione of Cassini's tour at Saturn. Targeted encounters require maneuvers to precisely steer the spacecraft toward a desired path above a moon. The spacecraft executed a 12-second burn using its thrusters on Aug. 9, which fine-tuned the trajectory to enable the upcoming encounter. Cassini’s closest-ever flyby of Dione was in Dec. 2011, at a distance of 60 miles (100 kilometers). Those previous close Cassini flybys yielded high-resolution views of the bright, wispy terrain on Dione first seen during the Voyager mission. Cassini's sharp views revealed the bright features to be a system of braided canyons with bright walls. Scientists also have been eager to find out if Dione has geologic activity, like Saturn's geyser-spouting moon Enceladus, but at a much lower level. Cassini has been orbiting Saturn since 2004. After a series of close moon flybys in late 2015, the spacecraft will depart Saturn's equatorial plane -- where moon flybys occur most frequently -- to begin a year-long setup of the mission's daring final year. For its grand finale, Cassini will repeatedly dive through the space between Saturn and its rings. The Cassini-Huygens mission is a cooperative project of NASA, ESA (European Space Agency) and the Italian Space Agency. JPL, a division of the California Institute of Technology, manages the mission for NASA's Science Mission Directorate in Washington. 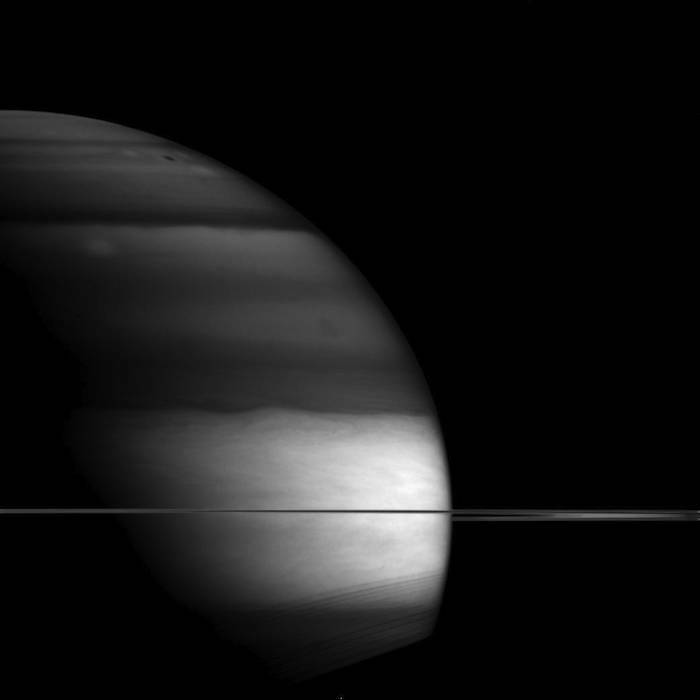 Saturn’s unusual appearance in this picture is a result of the planet being imaged via an infrared filter. Infrared images can help scientists determine the location of clouds in the planet’s atmosphere. In this image, Cassini’s wide-angle camera used a filter which is especially sensitive to infrared wavelengths that are absorbed by methane. Methane is not a major component of Saturn’s atmosphere, but enough of it is present to make a difference in how much light is reflected by different clouds. The darker areas reveal clouds that are lower in the atmosphere, therefore under more methane. Bright areas on Saturn are higher altitude clouds. Scientists think that these lower-altitude clouds are in regions where “air” is descending while the higher-altitude clouds are in regions where air is rising. Thus, images like this one can help us map the vertical air movements on Saturn. This view looks toward the unilluminated side of the rings from less than one degree from the ring plane. The image was taken with the Cassini spacecraft wide-angle camera on May 25, 2015 using a spectral filter which preferentially admits wavelengths of near-infrared light centered at 890 nanometers. The view was acquired at a distance of approximately 930,000 miles (1.5 million kilometers) from Saturn and at a Sun-Saturn-spacecraft, or phase, angle of 99 degrees. Image scale is 55 miles (89 kilometers) per pixel. While not bursting with activity like its system sister Enceladus, the surface of Dione is definitely not boring. Some parts of the surface are covered by linear features, called chasmata, which provide dramatic contrast to the round impact craters that typically cover moons. 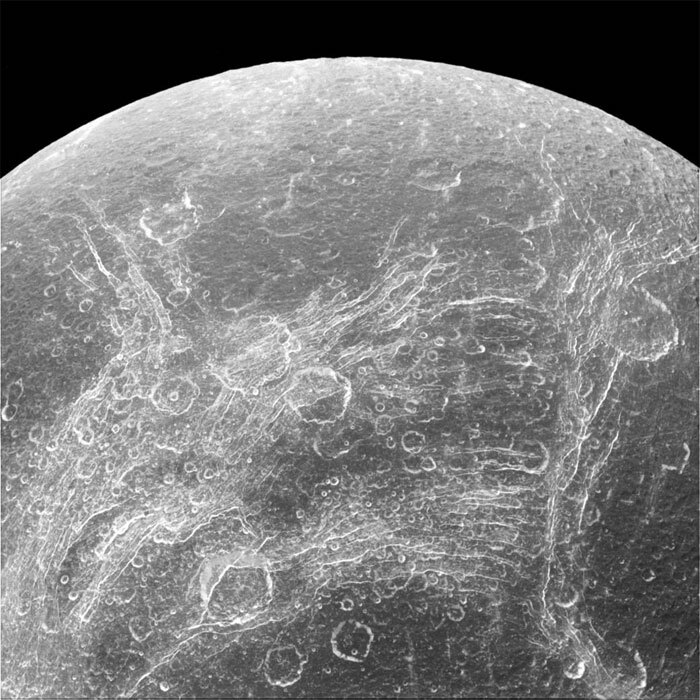 The bright network of fractures on Dione (698 miles or 1123 kilometers across) was seen originally at poor resolution in Voyager images and was labeled as "wispy terrain." The nature of this terrain was unclear until Cassini showed that they weren't surface deposits of frost, as some had suspected, but rather a pattern of bright icy cliffs among myriad fractures. One possibility is that this stress pattern may be related to Dione's orbital evolution and the effect of tidal stresses over time. The view was acquired at a distance of approximately 68,000 miles (110,000 kilometers) from Dione. Image scale is 2,200 feet (660 meters) per pixel. The Cassini spacecraft, which has been orbiting Saturn since 2004, has just taken its last look at the planet's icy moon Dione, resulting in some of the most extraordinary images from a mission famous for its extraordinary imagery. 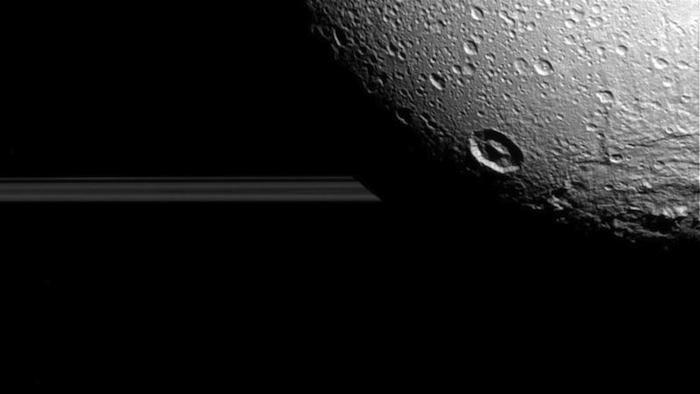 This composite of multiple images is close to the angle you might see if you were to look at Dione from Earth — though no telescope could ever resolve this much detail. The many craters and "wispy" surface features of the 700-mile-wide moon are clearly visible.Last is a shot taken from just 365 miles away from Dione, showing a region at the shadowy boundary between night and day. 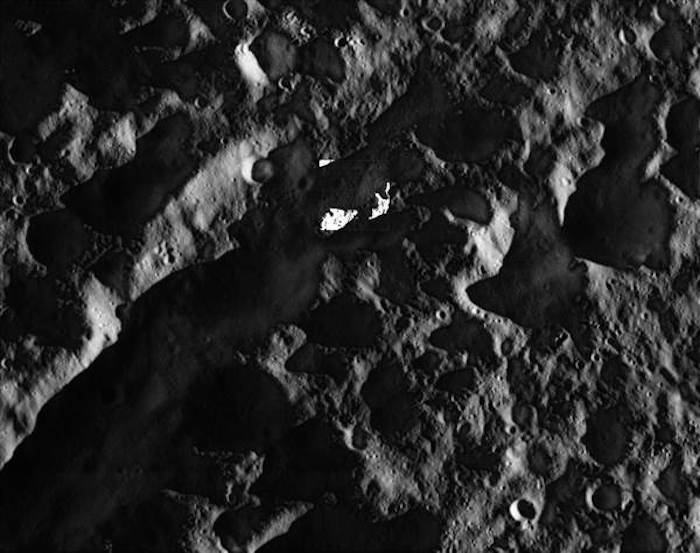 The overall view is from the wide-angle camera, but the high-contrast square above the middle is from the narrow-angle camera, which at this moment was taking the most detailed images ever of Dione's pocked surface. With a resolution of just 12 feet per pixel, you could make out a car or alien spacecraft if it was parked there. 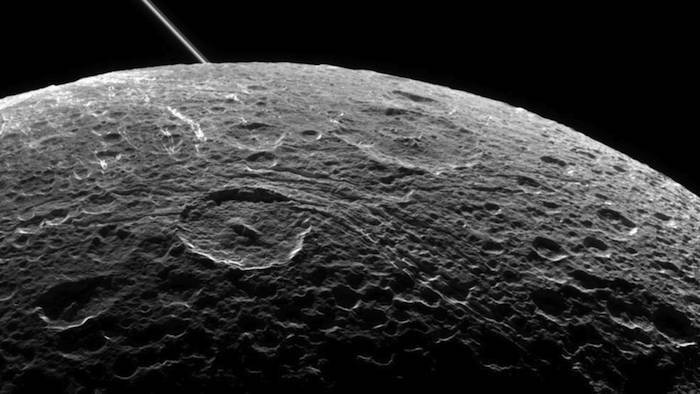 The flyby was actually used to perform some gravity science intended to help understand Dione's interior before Cassini moves on. In October it will near the moon Enceladus, passing within an incredible 30 miles — close enough to "taste" the icy spray emerging from its surface. 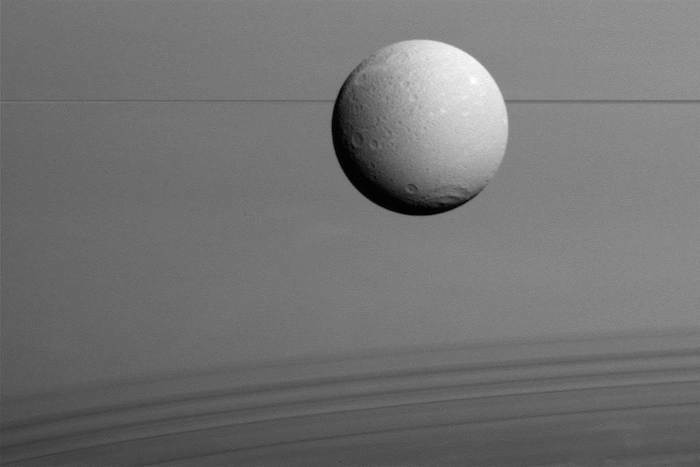 But this was the last time the probe will be putting Dione in the foreground. "I am moved, as I know everyone else is, looking at these exquisite images of Dione's surface and crescent, and knowing that they are the last we will see of this far-off world for a very long time to come," said the Space Science Institute's Carolyn Porco, Cassini imaging team lead, in a NASA news release. "Right down to the last, Cassini has faithfully delivered another extraordinary set of riches. How lucky we have been."